The second highly polluted area in the FSU is the region affected by the 'Kyshtym disaster'. The general location of this contaminated zone is about 100 km northwest of the city of Chelyabinsk, where more high-level radiation has been released into the environment than from Chernobyl. The Kyshtym disaster was actually three separate incidents of high-level radiation releases, occurring over the period 1949-64 (Monroe, 1992). 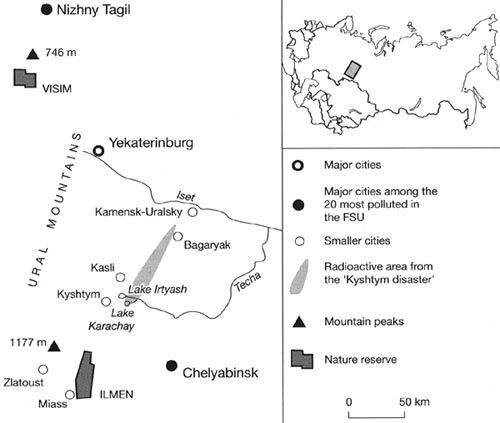 The location of the accidents was near the 'secret cities' of Chelyabinsk-40 and Chelyabinsk-65 (now called Ozersk), which were about 20 km east of Kyshtym (Figure 19.3). This was a huge complex, with a restricted area that reportedly covered up to 2700 km2 in the 1950s. The five graphite reactors located there produced over 58 tonnes of plutonium-239 through 1990 (Donnay et al., 1995). The accidents occurred at the Mayak Production Association's plutonium reprocessing complex. Since 1991, this facility has been frequently visited by Western nuclear specialists, and now operates as the 'first national fuel reprocessing plant' (Bradley, 1997). It is now known that at least 130 million curies of radioactivity have been discharged into the environment from operations at the Mayak plant. This staggering figure is about 2.6 times the amount of radiation released from the Chernobyl explosion and fire in 1986. In human terms, about 500 000 people have been exposed to elevated radiation doses, and about 18 000 have had to be relocated. Over 2000 workers have suffered 'occupational radiation sickness', 935 residents have been diagnosed with chronic radiation sickness, and 3 7 cases of leukaemia have been reported (Pryde and Bradley, 1994). The initial problem resulted from the deposition of millions of cubic metres of nuclear wastes directly into the Techa river, whose source is near the Mayak plant. These high level discharges into the river occurred mainly from 1949 to 1952; but contamination continued at a reduced rate until at least 1964. The Iset, Tobol, and Ob, which receive the waters of the Techa, were also affected. As many as 124 000 people who reside near the Techa were exposed to radiation, an estimated fifth of them to fairly high doses (Bradley, 1997). Residents of this area statistically suffer elevated rates of infant mortality and malignant tumours (Bradley, 1997). A separate study indicated significant increases in leukaemia in this region, believed to be caused by the wastes discharged into the Techa (Kossenko, 1990, 1992). The village of Muslyumovo, which was not evacuated, is 'still quite contaminated from past activities at Mayak', with radiation readings along the Techa there up to 40 times the norm (Bradley, 1997). The second crisis (the one originally referred to as the 'Kyshtym disaster') occurred in September 1957, but was generally unknown until the publication of Zhores Medvedev's 1979 book Nuclear Disaster in the Urals. Prior to 1986, it was the worst nuclear accident ever to occur. It involved a chemical explosion in a high level waste storage tank, which released about 2 million total curies of radiation, and over 100 000 curies of strontium-90, which were carried by the wind for hundreds of kilometres to the north-east, an area now known as the East Urals Radioactive Trace. Over 500 km2 of downwind territory received strontium-90 fallout in excess of 2 curies per km2 (Bradley, 1997; Donnay et al., 1995). The fallout just barely missed the industrial city of Kamensk-Uralsky (Figure 19.3). The accident necessitated evacuation of 7500 residents from twenty nearby villages, and large areas of forest were destroyed by radiation (Romanov et al, 1991; Bradley, 1997). The third large release of radiation at the Mayak facility involved high level wastes in a storage pond known as Lake Karachai. The filling of Lake Karachai began in 1951, when the discharge of wastes into the Techa river was terminated. The main release of radiation at this lake occurred in 1967 when, following a drought, winds picked up radioactive dust particles from the exposed shoreline of the lake, and deposited them up to 75 km downwind. The lake's bottom has since been stabilized to minimize further releases of radiation, but Lake Karachai remains the primary contamination problem at Mayak, and was studied in detail during the 1990s (Bradley, 1997). The contamination of workers at the Mayak plant has been extensive. From 1948 to 1960, a total of 2089 workers were diagnosed with 'occupational radiation sickness'. About 1500 Chelyabinsk-65 workers had 'chronic radiation sickness'; overall, 188 people had actual radiation burns, 41 suffered from 'acute radiation syndrome', and at least 4 persons died. Lifetime radiation exposure among workers at Chelyabinsk-65 was 30-80 times more than for workers at Hanford (Washington) and Oak Ridge (Tennessee) (Donnay et al, 1995; Bradley, 1997).